Thanks to community involvement (specifically thanks to https://github.com/jorich-2000), there is a new version of the Content Token extension. This version now supports Joomla, in addition to Drupal7, Drupal6, and WordPress. If you like this extension, you will also likely enjoy my other extension: the "Fancy Token" extension which provides tokens for upcoming events, contribution pages, profiles, and WebForms. I am looking forward to getting feedback on this. What a great piece of work! Thank you. Creating email newsletters and suchlike is a big time consumer for many organisations, and this will make things a whole lot easier. I'm wondering about the possibility of utlising this approach to deliver tailored content to users driven by their subject interests: e.g.if they aretaggedorin groups based on their subject area interests, could that somehow be leveraged by the token mechanism such that a only content tagged with matching taxonony terms is pulled in? I'm working a client right now who would love for this to be do-able. This seems like a very interesting idea. What it sounds like you want: If the recipient contact is in a group called "xyz" then include content with taxonomy/category term "xyz". Questions: What would the list of CiviCRM tokens look like when the back-office user clicks "Insert Token" ? What if the contact is in 59 groups? Should my extension logic attempt to include content from 59 taxonomy terms? Congrats on this very useful-looking extension. 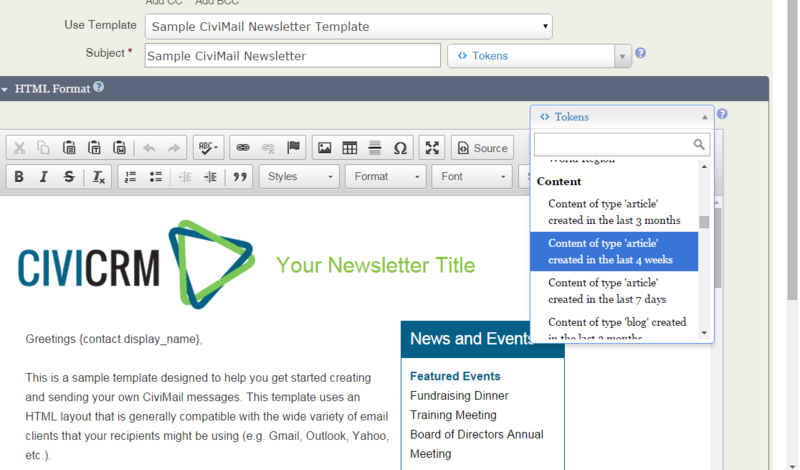 And cross-cms compatability... cool! "What would the list of tokens look like?" Good question, and as you point out if there are lots of categories it needs to be able to cope without having an unworkable number of tokens. I guess what I'm thinking about is a token that is itself tokenised (for wnat of a better way of explaining it), so that at the point of creation of the email the intended recipient's subject interests (be that recorded by tag or group) are checked, and the tokenised token is then replaced by the relevant tokens denoting the appropriate taxonomy term, and then each of those tokens pulls in the appropriate content. Saved a lot of work but now I have Civi 4.7 - Wondering If there is a version for 4.7 soon? Also Fancey Tokens?